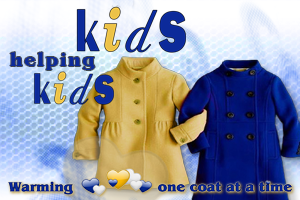 Is your school, church, business or organization planning a Coats for Kids drive? Welcome to the team! Below is a complete list of how to plan, promote, and organize a successful campaign. 2. First download and print Yale's Coats for Kids poster. You should then add your group's name and collections dates to theses signs. Then post signs in prominent locations for maximum visibility. Get kids involved by having them make custom marketing posters. Also, use social media to promote your coat drive. 4. Share! We would love to see pictures or video stories about the people involved in helping us with our Coats for Kids program . You can also post to our facebook page (facebook.com/yalecleaners) or twitter (#YaleCleaners). Yale will coordinate with The News on 6 for special news coverage when available. 5. Report. Please send an e-mail back to CoatsForKids@yalecleaners.com with the results of your successful coat drive. You could be featured on The News on 6 or on our web site. Thank you for your generous time and support.